Apparently shells are fascinating according to my kids. It was a veritable inquisition of what parts of the dish were shells. What’s in the shells? Where did the shells go? Is this a shell? No, that’s a sweet potato. After we got past the whole shell thing, the kids ate their mussels. We were shocked to find out that they both liked the mussels. I wasn’t surprised that Ariel liked them, she likes everything that a normal kids shuns, but I was shocked when Will asked for more. Personally, mussels aren’t my favorite. They’ve never been appetizing to me. They look weird and are often gritty, but if I prep them right I can tolerate them. This recipe comes from the Kona Cafe at the Disney’s Polynesian Resort. It has a wonderful citrus flavor and it surprisingly filling for such a little creature. 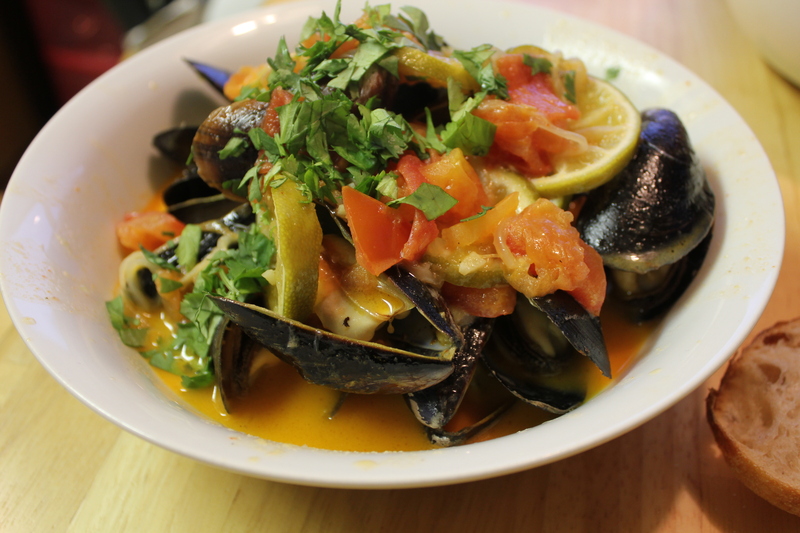 There are a couple of tips about mussels that I have found that make for a more successful experience. First off, mussels are highly volatile. They are best when purchased fresh and fresh for mussels means alive. That leaves us with a couple of issues; finding a good source and keeping them alive. In the United States, all mussels have to have a tag on them that notes their origin, the date harvested, and what amounts to their lot number. This allows the mussels to be traced back to the exact source and batch. This is done in case there is any type of illness that arises from a package of mussels. They can trace it back to the farm the mussels came from and determine who else may be exposed to contaminates. You should keep this tag handy for a couple days after you eat the mussels. If something goes wrong, it may be beneficial to trace the mussels pack to their siblings to find out what is making you ill. The most useful info on this tag for normal people is the harvest and ship dates, You want to get a date that is as close to the current date as possible, mussels live in water for a reason. They longer they are out of the water, the more likely they will not survive. My wok, it's supposed to turn black like that. My Wok with it's "cover"
Once you find a good supplier, you need to know how to treat those mussels once you have them home. Ideally it’s best to purchase your mussels the day you intend to cook them. Unfortunately, most of us do not get to go to the grocery store every day. If you have to, you can hold them for a day or two. What we need to do is keep them chilled and moist. We can accomplish that by removing the mussels from the packaging and place them in a metal bowl. It is important to remember that hot air rises and cold air falls. Since the cold air sinks to the bottom, you want the cooling source to be above the item you want cooled. Our cooling source is just going to be some Ice over the top of the mussels. To retain the moisture, I usually place a damp paper towel over the ice. 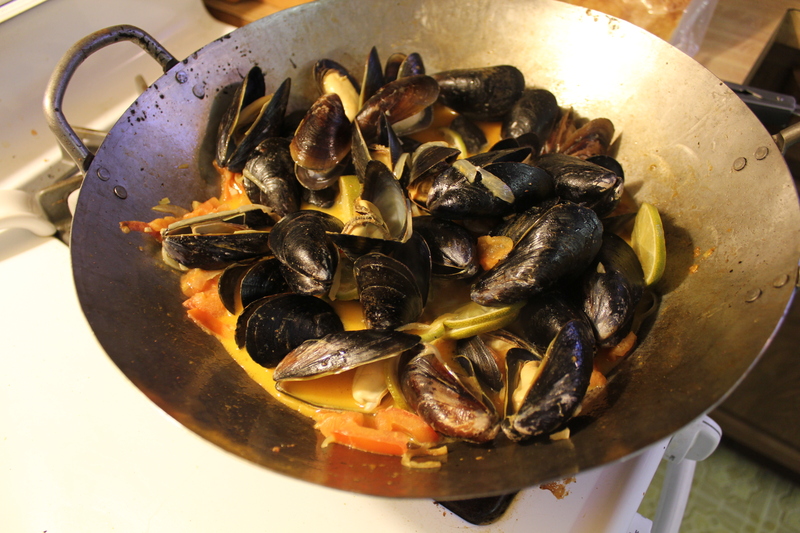 When you are ready to cook the mussels, you should check for any cracked mussels, throw them out. Also if there are some mussels that are open and do not react in any way to you tapping their side, I would throw them out also since live things usually respond to being threatened. The lack of response makes me feel like they may no longer be alive. It’s not a full-proof way of determining if the mussels are dead, but I would rather throw out some live mussels than eat a dead one and spend the night with my toilet. Once you toss the probable dead mussels, you want to clean them up. Sometimes they are pretty clean, at other times they are not. If you don’t make sure all the grit is off the shells, it’s going to end up in your dish and it doesn’t taste good. Depending on the quality of the source of the mussels, you may have to de-beard them. The beard is the little stringy thing that sometimes sticks out the side. Use needle nose pliers and just yank it out. Now that our mussels are ready, on to the dish. The hardware we are going to use in this case is my steel wok. A good steel wok is actually not that expensive. I got mine for $20! 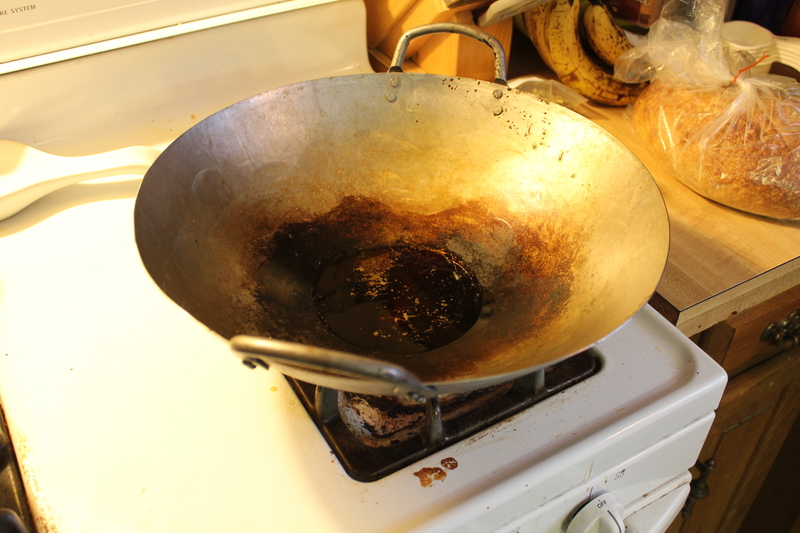 If you do want to buy a wok, it should be made of steel and should never have Teflon or any other coating on it. 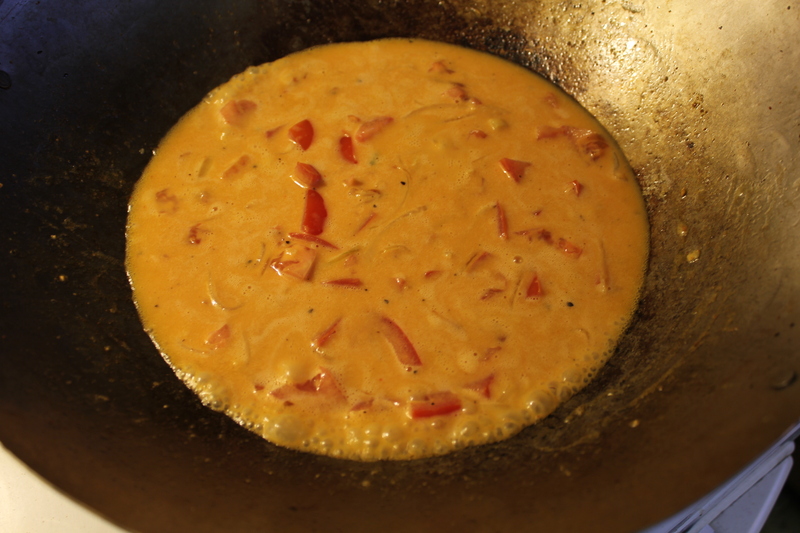 Wok cooking requires very high heat that would break these coatings down into what amounts to poison. (I do support the use of Teflon for certain cooking applications, but it must be under heat conditions that will not cause it to fail. 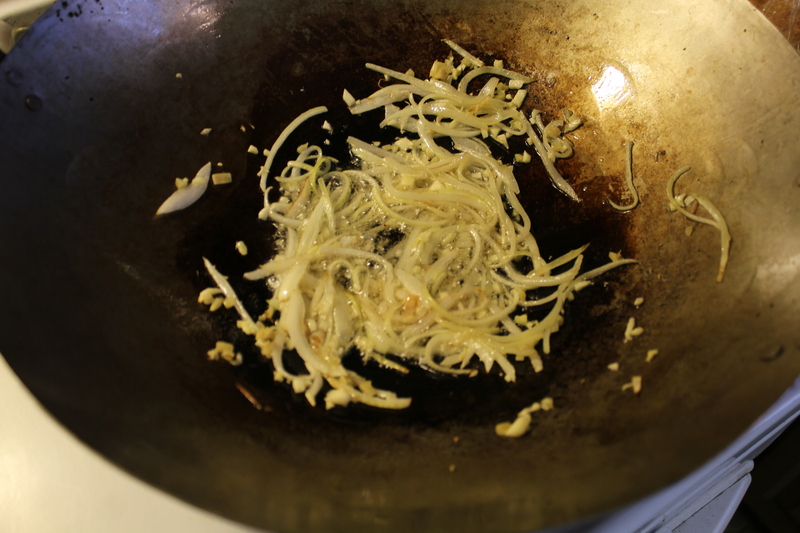 Wok cooking is at very intense heat that is concentrated upon a small area of the pan. I’ve seen Teflon break down on a wok, be very careful) Make sure your wok is heavy steel. Since we are going to be putting this over very high heat(some people say that using a burner from a turkey fryer gets you the kind of heat you would want, be careful! ), you don’t want a wimpy pan that your going to burn through. They do sometimes sell covers for your wok. I don’t think this is necessary, A stainless steel mixing bowl does the job just fine(see pic). I put the wok over the highest heat my stove would allow( don’t have a turkey fryer). Once the wok is hot, I added the oil and let it warm for a moment, then tossed in the onions and sauteed for a minute (If you found green tomatoes, you would add them in here, I couldn’t find any at this time, so I used red tomatoes). after the minute I added the ginger and garlic, and stir fried for about 2 minutes, don’t let it just sit, keep the food moving. 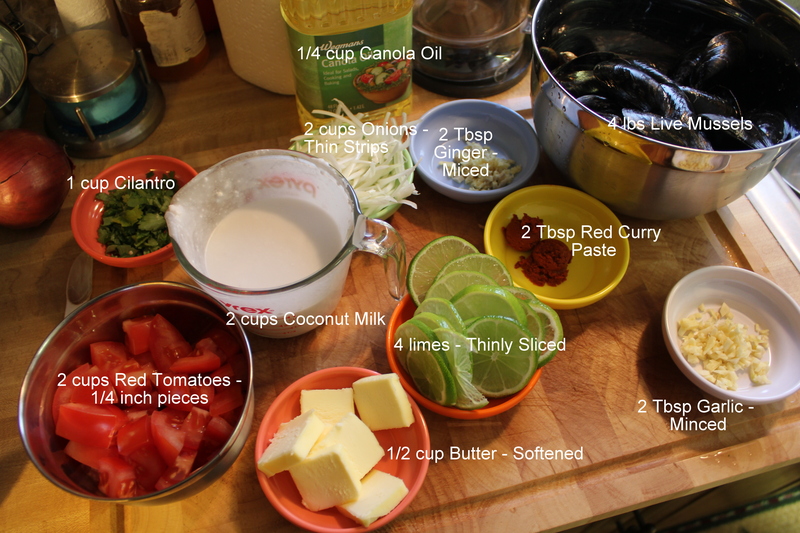 Once the onions are soft, Stir in the curry paste, the recipe called for green curry paste. I used red curry paste, I had some in the fridge. It was close enough and it’s like $4 for a little bottle (blogging doesn’t pay the bills). Next in, the butter(softened) and the coconut milk. 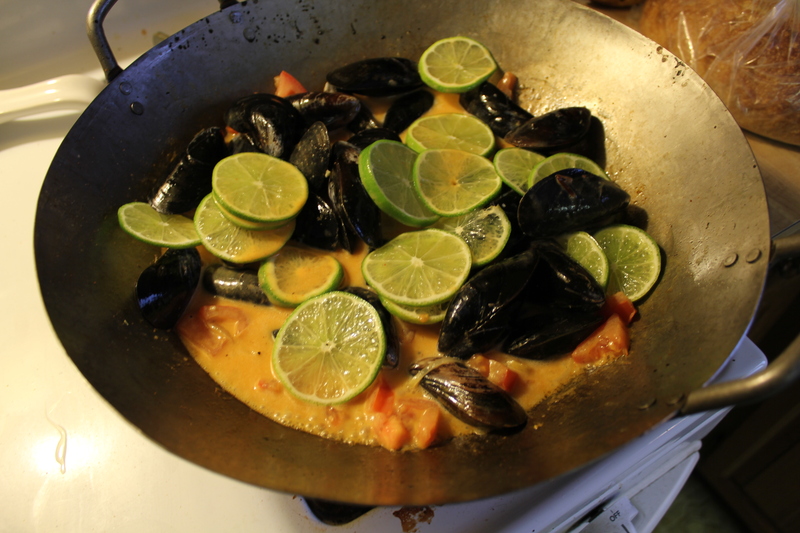 Stirred it up, added mussels, and seasoned with some salt and pepper. Tossed in the lime slices and the red tomatoes. 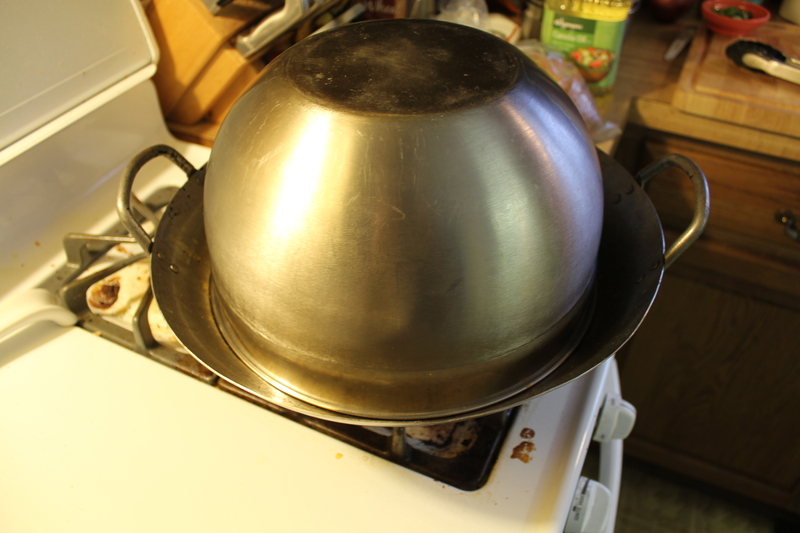 I covered with the stainless steel mixing bowl and let steam for five minutes. over medium-high heat. 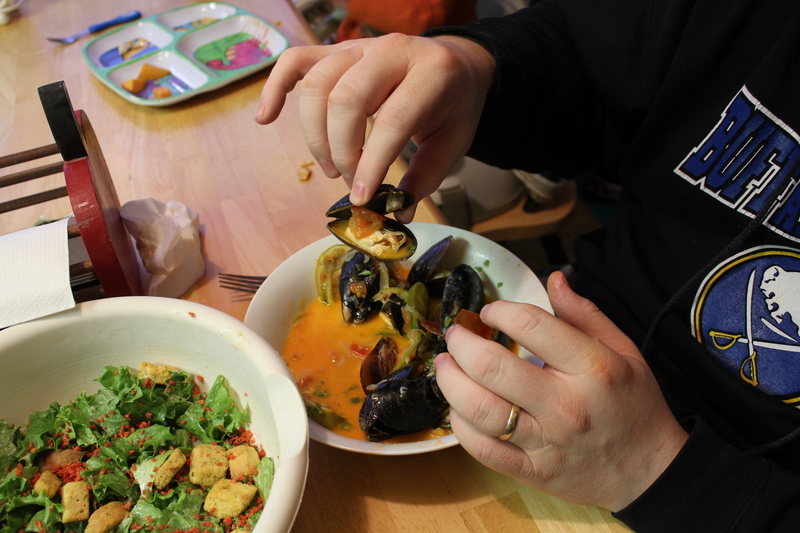 The mussels actually needed about eight minutes. Once they were mostly open, I added the cilantro. If some of the mussels didn’t open, throw them out. Dish it out and enjoy. Oh Yeah, You can also use the mussel shell as a spoon, detach the muscle connection, scoop some broth and into your mouth. Have fun!